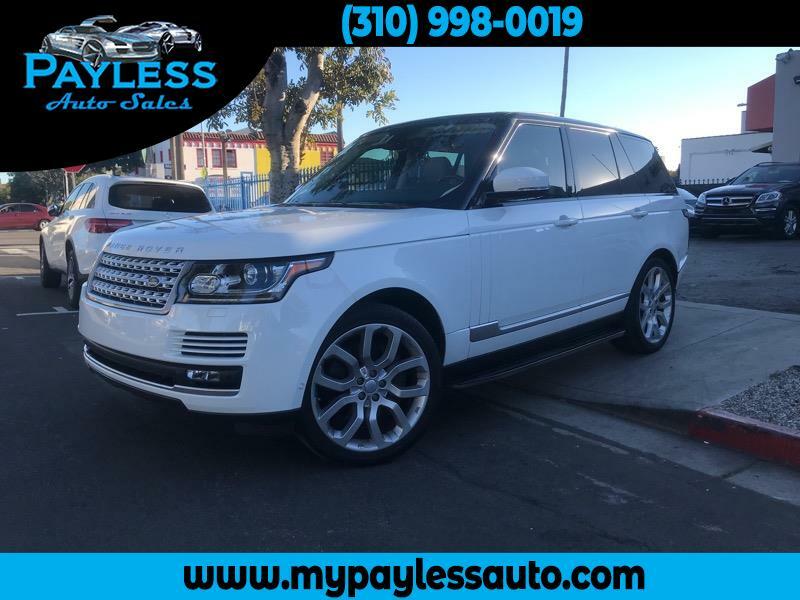 OUR 2015 RANGE ROVER HSE SUPERCHARGE IS A DREAM CAR TO DRIVE AT SHINY LOS ANGELES DAYS!! GREAT COLOR COMBINATION WITH FUJI WHITE EXTERIOR AND ALMOND / ESPR / ALM / IVORY INTERIOR WITH PIANO BLACK TRIM DETAILS WILL MAKE YOU FALL IN LOVE AT FIRST SIGHT TO THIS GORGEOUS CAR!! THIS BEAUTY HAS MORE THAN YOU WOULD ASK FOR! NAVIGATION, 360 VIEW BACK UP CAMERA, PARK ASSIST, VISION ASSIST PACK, BLIND SPOT AND CLOSING VEHICLE SIGNAL, ADAPTIVE CRUISE CONTROL WITH INTELLIGENCE EMERGENCY BRAKE ASSIST, REVERSE TRAFFIC DETECTION, ADAPTIVE XENON HEADLAMP WITH HIGH BEAM ASSIST, LANE DEPARTURE WARNING, TINTED GLASSES, 22 INCH WHEELS, PANORAMIC ROOF, SUNSHADE, VALET MODE, TOUCH SCREEN, MERIDIAN SOUND SYSTEM, CHILD LOCK, KEYLESS ENTRY AND START, TIPTRONIC TRANSMISSION, BLACKWOOD/LEATHER STEERING WHEEL, HEATED STEERING WHEEL, HEATED AND VENTILATED SEATS, FRONT MASSAGE SEATS, HEATED SEATS AND AC AT BACK, BLUETOOTH, AUX, AC, CD, RADIO, CRUISE CONTROL, UNIVERSAL GARAGE DOOR OPENER.. CALL US TO MAKE AN APPOINTMENT BEFORE THIS GREAT DEAL IS DONE. Message: Thought you might be interested in this 2015 Land Rover Range Rover.